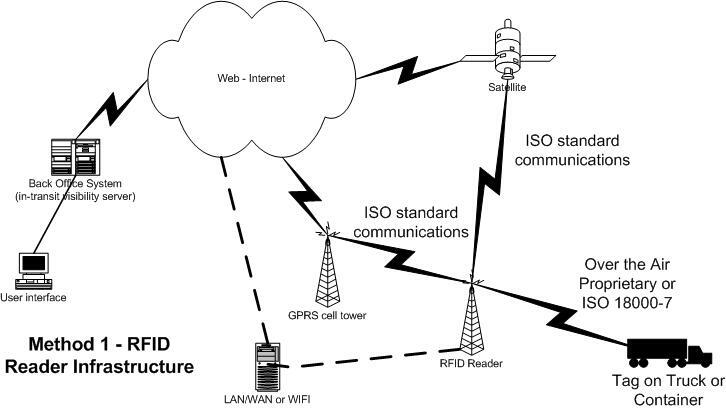 What we haven’t discussed is whether the ISO 18000-7:2008 standard is the only way today to get to true interoperability, at least in the context of WiFi, satellite, or cellular (GPRS) based tags/transponders. Standards are key to building an interoperable heterogeneous infrastructure. They allow multiple players to compete for the stakeholders’ business, thus allowing lower costs and less risk caused by the failure of a single provider. Active technology has had two delivery methods. One method consists of tags that talk to a reader network which, in turn, communicates via LAN, WAN, or web to users or other back office systems to include in-transit visibility systems. The second method skips the reader infrastructure. It consists of tags talking via the LAN, WAN, or web to the users or back office systems. This method often uses WiFi, cellular/GPRS, or satellite technology. The second method has always relied on communication standards for its interchange of information to users and back office systems. The manufacturers’ approach to compliance with these standards has been proprietary to their solutions but still allowed an interoperable exchange of information. The first method of delivery for active technology has had no over the air standards until the US DoD worked with the International Standards Organization (“ISO”) to develop the 18000-7:2008 standard. The standard has enabled the interoperable communication between tags and readers from different manufacturers. Equally important is that that 18000-7 standard defined the way the data on the tags is stored and formatted such that this interoperable communication is also interoperable at the data level. Thus, communications to disparate back office systems is compliant not just at the communications level but at the data structure level as well. This is true for all the primary data blocks included in the standard. The standard does allow for a user defined data area, standardized in its location within the tags storage but not standardized within its block area for data structure and organization. The DoD with its RFID III requirements went that one step further and standardized the organization and structure of this user data area. The second method allows for interoperable communications of data between different manufacturers equipment but it does nothing to standardize the data structures within those communications. Thus, even though the tags can talk effectively to different back office systems their data organization is proprietary and interoperability is not really present, or at least effective. Today, only communications that are standardized AND make use of the 18000-7 data structure standards are truly interoperable and effective. The 18000-7 standard doesn’t cover everything needed. 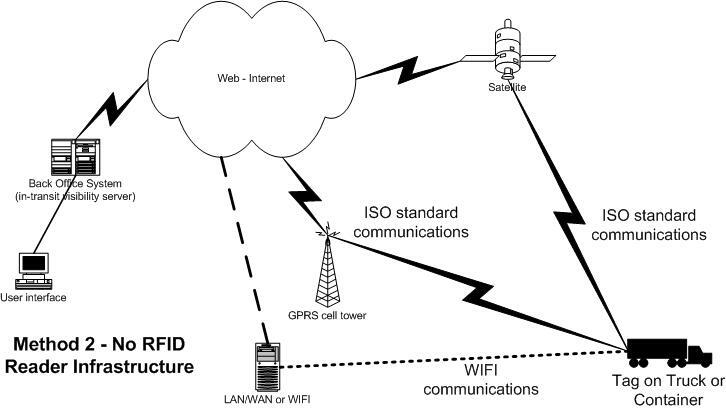 It omits some sensor functions, for example, and the remainder of the RFID III statement of work filled in many of the gaps by adding data structures for the user data area and host/in-transit visibility server (“ITV”) communications but the bottom-line for commercial operations is the 18000-7 standard enables the implementation of cost effective infrastructures and in-transit visibility systems. What has been needed for active RFID to mimic the interoperability success of the passive world was a set of standards from a recognized standards body and a clout-heavy adopter. The US Department of Defense and its NATO (North Atlantic Treaty Organization) partners (about 40 nations in total) constitute that clout-heavy adopter, and the ISO standards group is that globally recognized standards body. Interoperability for active RFID: at last, different vendors work together like passive RFID! Interoperable RFID – Show me the money! Interoperable RFID – How will the money be delivered? Interoperable RFID – Why hasn’t this been done already? Interoperable RFID – Who are the players? This is our fifth post of this series on interoperable active RFID and the ISO 18000-7 standard. So far, we have discussed how the standard allows true interoperability in the active RFID technology environment and we have discussed where the value of that standard can be derived in the international shipments market. We have also posited a technical and solution framework that is needed to deliver on the value proposition. We have discussed what has been tried and how those previous efforts fared. Finally, in this post we will discuss some of the current players and a method for evaluating their fit with our evaluation framework. 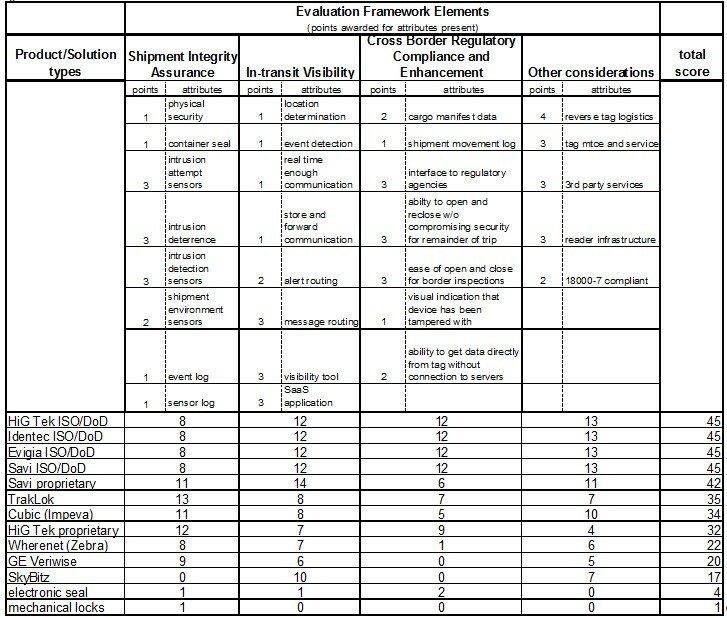 Shown below is a matrix of companies that are competing in some or all aspects of the evaluation framework described in this report. Each vendor has been evaluated and scored on each key business value driver against key attributes that the framework describes as necessary to deliver true business value. 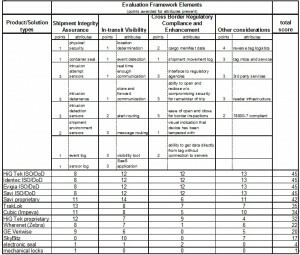 The maximum score is 60 points, representing 15 points in each of the four evaluation areas, shipment integrity assurance, in-transit visibility support, cross border compliance enhancement support, and other considerations. Location determination –to the level appropriate for the shipment, e.g. latitude/longitude, last known reader location, closest other location marker, etc. Store and forward communication – the ability to store messages at the tag level until such time as the tag can communicate to the reader infrastructure. This capability allows the tag to move in a communication dead zone and then “catch up” when communication is re-established. As a reminder, this matrix is for only a portion of the competitors that offer active RFID products/solutions. It is not meant to be an exhaustive evaluation by any standard but is meant to show that at least some of the evaluation framework is available today. This is our fourth post on interoperable active RFID and the ISO 18000-7 standard. So far, we have discussed how the standard allows true interoperability in the active RFID technology environment and we have discussed where the value of that standard can be derived in the international shipments market. We have also posited a technical and solution framework that is needed to deliver on the value proposition. In this post we will discuss what has been tried before so that we can understand what hasn’t worked or delivered on the promise and can apply those learnings to the new world of interoperable active RFID. There have been many initiatives over the past several years focused at creating the “intelligent container”. This space seems to have a revolving door of participants. Most notably, IBM and GE have left this market in recent years. At the same time, others have made a strategic push to commercialize the technology and create a revenue stream. Discussed here are several of those previous initiatives and what has transpired with them. Early GPS was nurtured by Schneider National, specifically Don Schneider was attempting to expand his company’s image as a technology leader. They partnered with Qualcomm, guaranteeing to outfit their fleet with Qualcomm GPS units. Although the price was high (per unit and in total), Schneider generated significant competitive advantage and became known as the industry technical leader. This technology/customer relationship was critical in establishing the product as a standard. Schneider paid a more than “reasonable” price per unit, but got the jump on competition (image-wise and technology-wise), and Qualcomm got a customer and a case study that they could promote, as well as a national beta test. Although this example isn’t really about active RFID, it does demonstrate how technology standards when coupled with appropriate solution processes can turn into a bona vide success. Born out of the military, Savi Networks is the commercial arm of Savi Technology. This company provides devices and a SaaS (software as a service) ITV product, providing visibility of containers as they traverse the globe. The original concept was to create commercial visibility via RFID. However the infrastructure costs were too large. The solution migrated to its current state, utilizing a GPS/GPRS platform. The devices obtain their location via GPS and communicate this data via 2G/3G cell service. The data can go directly to the SaviTrak visibility tool or directly to the client ERP (enterprise resource planning) solution. Savi Networks does not support two-way communication, and therefore its solution was not configurable after it had been deployed. Savi Networks has two devices currently. Both devices provide location updates via the GPRS platform. Its legacy device has an array of sensors that track light, shock, temperature, and humidity. In addition, it has an arm that senses whether the door has been opened. It is not meant for theft deterrence. This device was adopted from Savi Technology and will not be supported long term. The second device is a form of electronic seal. It attaches to the container through the hasp and creates a physical deterrent. If this device is removed, a message is sent immediately to a predefined list of recipients. Savi Networks started as a device neutral offering, looking to provide a visibility solution that was populated by mobile tracking devices. The company has since changed gears and is selling a particular device that populates its visibility platform. Although this device will interface with other devices to create a solution, it is not the company’s primary focus. Finally, the venture has taken a long time and consumed significant capital and other resources. Recently, Savi Networks has dramatically reduced staff and limited its future plans. OnAsset positions itself as a “mobile to mobile” (M2M) solutions provider. The company’s focus is on asset visibility and security. In the asset visibility space, OnAsset has solutions deployed that incorporate RFID, 2-way satellite, GPS & GPRS. Furthermore, the company claims the technology will interface with WiFi and Mesh networking utilizing ZigBee (interoperable device to device communication like Blue Tooth or WIFI). Like Savi Networks, it offers a visibility platform named OnAsset that provides internet visibility of the devices and their respective status. OnAsset’s Sentry platform is used in a multitude of devices tailored for specific applications. The company offers a standard sensor unit that is utilized in a variety of form factors which track location, temperature, humidity, and shock. Currently, it offers a device designed for ocean container tracking which is similar to the Savi Networks device. This device attaches to the door and will alert designated recipients if the door has been opened. In addition, the company has a product called FlightSafe that is approved by the FAA for in flight use (air containers). Finally, there is a magnetic unit that is appropriate for container, trailer, or rail use. This magnetic device can incorporate a security cable that will notify the shipper of any breach. The OnAsset solution allows for multiple communication paths based on the lowest cost method. In addition, the units can support 2-way communication via GPRS, RF and Satellite, and are configurable over the air. Like Lockheed Martin (Savi parent company), Qinetiq North America is heavily tied to the Department of Defense. It intends to push into the commercial space in order to broaden its revenue portfolio. The intelligent container is an area the company is starting to develop. Currently it is developing the visibility platform and data integration points. To get to market quickly, the company is using devices and limited technology from OnAsset. Long term, it will work with device manufacturers like Impeva Labs/Cubic. This full solution set as implemented by DoD with its 40 NATO country allies and other allied militaries is the only existent interoperable active RFID solution that functions globally, provides visibility via an on-demand SaaS-like solution, and includes the ability to operate independently of access to any network or computer solution. The technical RFID capabilities are provided through four prime contractors; Unisys Corporation, Savi Technologies, Systems Process and Engineering Corporation (SPEC), and Northrup Grumman. The hardware providers included Savi Technologies, IDENTEC SOLUTIONS, HiG Tek, and Evigia. The in-transit visibility system is primarily operated by the US Army as the single largest user of the RFID II and III solution and is called TAV-ITV (Total Asset Visibility, In-Transit Visibility). Additionally, the USAF, USN, and DLA (Defense Logistic Agency) operate their own ITV systems. This solution is viable, active, and being rolled out globally as a replacement for the current Savi proprietary RFID II solution that has been in use for over 10 years. Unfortunately, the Department of Homeland Security has failed to lead. It has failed to mandate a standard, define a standard, or adopt a standard. Hence, it has not taken advantage of the groundwork laid by the US DoD. This is our third post on interoperable active RFID and the ISO 18000-7 standard. So far, we have discussed how the standard allows true interoperability in the active RFID technology environment and we have discussed where the value of that standard can be derived in the international shipments market. In this post we will discuss what is needed to deliver that value. In our last post, we introduced the concept of an evaluation framework that can be used define the market as well as the key business drivers. Now we are adding to that framework the attributes that any solution needs to be capable of delivering the key business values of shipment intrusion assurance, in-transit visibility, and cross border regulatory compliance. These attributes can be used, in a broad sense, to evaluate the products and solutions currently on the market. The technology framework to deliver the business value to the key stakeholders must incorporate physical security of the container, sensor assessment of key environmental factors affecting the shipment, multiple form factors for tags and readers, enablement of storage and recall of user-defined shipment data (e.g. master bill, bill of lading, cargo manifest, packing slip, etc. ), determination of container location in the world that is situationally appropriate, and communication of these data to in-transit visibility servers on demand or on a schedule. Physical security of the container should allow for intrusion detection at a minimum, with intrusion attempt detection preferred. The inclusion of sensors for this detection as well as assessment of shipment environmental factors (e.g. temperature, shock, humidity, light, door opening, vibration, etc.) is essential. Multiple form factors allow for the application of interoperable tags with similar functional capabilities in different shipment and cargo packaging situations (e.g. attachment to a container, pallet, vehicle, etc.). Readers with similar capabilities but also in different form factors (e.g. fixed, transportable, hand held terminal, imbedded in a laptop or notebook, etc.) allow greater flexibility for data collection and tag location determination. The ability to carry shipment/user defined data when coupled with a hand held device allows determination of shipment characteristics, validation of shipment integrity, and consignee/consignor determination without connection to a central computer system or network. Such on tag data also enable searching of multiple containers to find the one(s) that match specific criteria and then determining their specific identity and location. Container location determination is going to be dependent on reader infrastructure capabilities. Based on the specific situational need, location in proximity to a fixed or hand held interrogator may be adequate, whereas in other situations determination of the latitude and longitude in real time may be more appropriate. • enable communication of specific message types to predefined entities (e.g. consignee, consignor, carrier, freight forwarder, customs authority, border control, etc.) to enhance the shipment’s movement through the supply chain. a. The manufacturer of the hardware attached to the containers and the reader infrastructure. b. The reader infrastructure provider and maintainer. c. The in-transit visibility server infrastructure provider. d. The reverse logistics service provider that helps insure that the tags are reused and may also provide maintenance service for the tags. These functional elements are all needed and may be provided by one or more entities. For instance, some shippers want full control of their shipments, and they may determine that it is best for them to own their own tags and manage the maintenance and reverse logistics of the tags themselves. Other shippers may want the benefits without direct ownership and will contract with a third party services provider to take care of the operational details. In our last post, we discussed how the adoption of ISO standard 18000-7:2008 by the US DoD and NATO as allowed interoperability between different active RFID manufacturers for the first time. What we didn’t really address is the “so what” factor. Where does this standard deliver value in the supply chain and who is the recipient of that value? After all, a technical standard that doesn’t save money or generate a capability that makes a supply chain more efficient is just an interesting intellectual and technical exercise. Perhaps the best way to show this value is through an evaluation framework that incorporates the business value drivers for one or more stakeholders in that market, describes the technical and functional solution set necessary to deliver those values, and also addresses the roles of international, national, and/or business standards. The specific market being discussed is the movement of shipments internationally, either in ocean containers, over the road trucks, or by rail. The air freight market is specifically excluded because systems and processes exist that allow the realization of these business values. This framework describes a total solution and is not limited to a perception that all components are the result of the efforts of one provider. In fact, the reality is the opposite. This framework presumes that multiple players/stake holders in either a formalized alliance or a loose confederation are involved in providing the solution that drives the value to each stake holder. The actuality is that this framework REQUIRES a network of players to be successful; thus allowing a heterogeneous solution with multiple solution provider sources. There are three key business value drivers for most stakeholders involved with international supply chains. The first is Shipment Integrity Assurance. Shipment integrity assurance is the determination and presentation on demand of information that confirms that since the shipment originated at the shipper’s (consignor’s) location, it has not been tampered with, and that key environmental aspects important to the shipment’s contents have not strayed beyond pre-determined limits (e.g. temperature, humidity, shock, etc.). The third driver is Cross-Border Regulatory Compliance and Enhancement. Cross-border regulatory compliance and enhancement is all about helping a shipment cross international borders as quickly as possible with minimal delays for inspection, shipment manifest verification, and customs, duties, and regulation compliance. There are at least four key stakeholders involved in international supply chains; shippers, port or border crossing operators, carrier or transportation providers, and government agencies (e.g. customs, border clearance operations, etc.). Shippers have the most to gain from each of the three business value drivers. They want their shipments to move through the international supply chain as quickly as possible, but even more important than speed is reliability. They need to minimize the variables that alter a shipment’s transit time. They also want to minimize the costs associated with that movement. Delays for inspections that were not anticipated may add storage and handling fees that were not expected. Port operators benefit because anything that helps them move a container through their port more quickly than competing ports helps them gain new customers and higher freight throughput. Government agencies can benefit from having shipment integrity assurance and more automatic communication of the information to their systems. However, they seem to be the slowest to adopt and incorporate the new technologies. Several previous initiatives will be discussed that had government sponsorship but still are yet to take off effectively. Carriers and transportation providers, except for air freight, are definitely laggards in adopting systems that can benefit from these technologies and processes. They typically have small margins and want others to pay them to incorporate new methods or solutions. Active RFID is the style of RFID that has been around the longest. It has remained, until the 18000-7 standard, a world of conflicting proprietary approaches ranging from frequency choice to low level protocol nuts and bolts. Over the years the read ranges have climbed from a couple of meters to 100 meters and more, battery life has been extended to 5 years, costs have come down, sensor technology has been incorporated, yet interoperability was still missing. There was no inherent advantage for any one vendor to share its technology or to push for a common approach – the market was still very much about differentiation due to the hardware technology itself. ISO 18000-7:2008, adopted and initiated by the US DoD, based on their practical experiences with a proprietary approach, has led to this break through. This post is the first in a series of five posts that will address interoperability of active RFID, how it can benefit shippers, what it will take to be a bona fide solution and not just another technology play, what has been tried in the past, and who is involved now. This breakthrough is similar to what the passive world experienced when EPC Global came into being, Wal-Mart and the DoD adopted it, and then all the hardware providers started to play nice with each other. What the ISO 18000-7 standard has done, along with the US DoD issuing a request for proposal (RFP) for a very large contract award, is to get four hardware manufacturers to adopt the standard and develop products that effectively interoperate over the air with each other. These manufacturers are Evigia, Hi-G Tek, IDENTEC SOLUTIONS, and Savi Technology. The DoD statement of work (SOW) (the project is called RFID III) also mandated and funded testing to prove that the products were interoperable. This testing was done at the Pacific Northwest National Laboratories in Washington State. Further, the SOW mandated that each vendor had to field tags (transponders) in six different form factors, a fixed reader (interrogator), and a mobile reader (interrogator) that would attach to and work with a handheld data terminal (e.g. a Motorola 9090 unit). The military had many reasons for doing this, but the bottom-line for the commercial side is to open up the prospect that infrastructures and in-transit visibility systems could be built and be cost effective. What has been needed for active RFID to mimic the interoperability success of the passive world was a set of standards from a recognized standards body and a clout heavy adopter. The US Department of Defense and its NATO partners (about 40 nations in total) are that clout heavy adopter and the ISO standards group is that globally recognized standards body. The 18000-7 standard doesn’t cover everything needed, it left out some sensor functions for example, and the remainder of the RFID III SOW filled in many of the gaps by adding data structures for the user data area and host/in-transit visibility server (ITV) communications along with other standards compliances important to the military (e.g. electromagnetic interference (EMI) in and around aircraft of all sizes). What is needed now is the adoption by a major government regulatory agency (say the US Department of Homeland Security), the development of user data area standards, and the incorporation of methods for upload of this data to commercial ITV servers (like the services provided by Descartes Systems Group). We will have to wait and see what actually happens. I will write more on this as time progresses. The ISO 18000-7 standard by visiting the Dash-7 Alliance web site (http://www.dash7.org/index.php?option=com_content&view=article&id=1&Itemid=2).